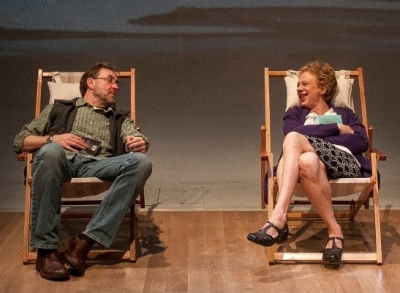 Interview: Veteran actor studied effects of dementia and character’s core personality in playwright Christine Mary Dunford’s “Still Alice,” at Lookingglass Theatre through May 19. 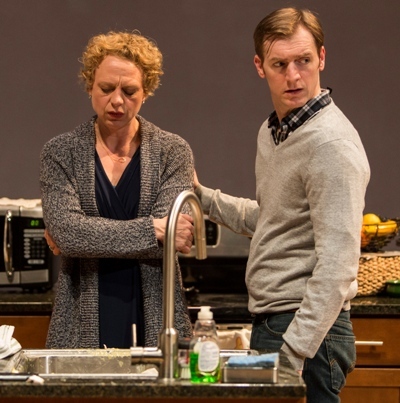 To watch Eva Barr play out the progressive, early-onset dementia of the woman at the center of “Still Alice” at Lookingglass Theatre is to forget you’re looking at the subtle, skillful work of an actor. 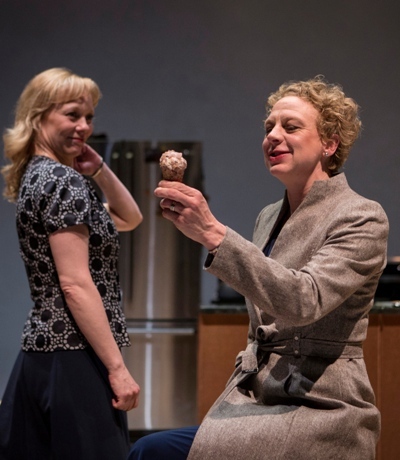 Yet hardly less remarkable is the way Barr arrived at the role: She began, in first readings with playwright-director Christine Mary Dunford, by taking a different part, an alternate Alice – a separate character Dunford identifies simply as Herself. So Barr, who helped to create Lookingglass in 1988 after theater studies at Northwestern University, asked Dunford if she could switch and read Alice. The playwright agreed. For the role of Herself, they called on Mariann Mayberry, a familiar face at Lookingglass and a personal friend of Barr. 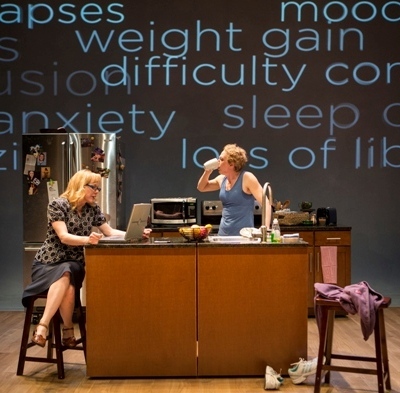 Dunford’s play is an adaptation of the book “Still Alice” by Lisa Genova, about a noted expert in cognitive psychology who, at age 50, shows first signs of Alzheimer’s disease. Alice’s decline is spasmodic, punctuated by periods of clarity in which she is highly functional – only to plunge further into a confused disconnect from her family, her household, even from herself. In reshaping Genova’s book for the stage, Dunford decided to give an external voice to Alice’s extensive ruminations on her plight: Thus she created Herself, a part of Alice that might be viewed as her healthy mind, the core of her personality. While that core never disintegrates, it does grow simpler, ultimately to a state that is almost child-like. It is what remains of Alice as her agile brilliance erodes. But it is still Alice. Though some funny stuff happens early on, comedy soon vacates the stage. The tricky part of playing Alice, says Barr, was not to overplay – but to allow her mental decline to happen progressively, indeed by irregular gradients. At one point, when the debilitating effects of Alzheimer’s are well established, Alice – once a formidable scholar and lecturer — recovers her connectivity well enough to plan and deliver a talk on her experience with the disease. “My grandfather had Alzheimer’s, and to watch him was eye-opening,” says Barr. “You really don’t lose the core of yourself, no matter how advanced the decline. Once I’d taken on the role of Alice, I began reading a lot about dementia and Alzheimer’s. One’s natural intelligence will affect the extreme nature of how the disease can play out. Alice’s mid-life physical health is expressed in her zeal for daily runs. (Barr took up running to look as well as feel the part.) Her mental centeredness can be read in Mariann Mayberry’s composed figure of Herself, working at a laptop or just hanging around at the edges of a scene. Herself constantly gives voice to Alice’s silent observations. “This is Alice’s consciousness of her decline,” says Barr. 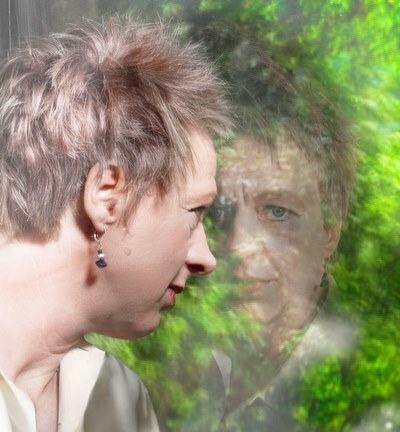 “One’s relationship to oneself is essential in this journey (through Alzheimer’s). I spoke with psychologists and case workers about the sense of self in Alzheimer’s patients. It’s a gray area. By the time they’re losing touch, they’re not able to articulate it. But there is this cycle of denial, frustration, anger, frustration. A lot of the work Mariann and I did in figuring out our dynamic was on our feet. Meanwhile, the strain on Alice’s family – son (played by Cliff Chamberlain), daughter (Joanne DuBach) and husband (Chistopher Donahue) – nears the shattering point. The son, a lawyer whose career is just starting to take wing, goes into stony denial. “He needs Alice there as she has always been for him – the high-powered, articulate mother, his model,” says Barr. “But the daughter becomes her emotional anchor. Alice’s relationship with her husband (also a college professor) is complicated. I think they love and respect each other as intellectuals, but Alice’s decline reduces her to much more of an emotional being than she ever allowed herself to be. He is unmoored by the situation.